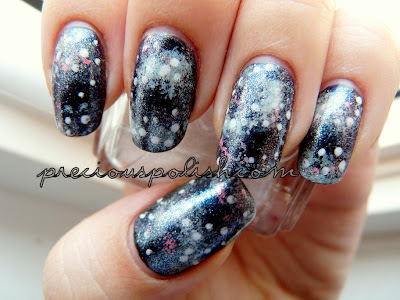 I still haven't tried galaxy nails. These looks great! Definitely better late than never! They turned out great! I like how the Pure Pearlfection looks! i like the peeks of coral/red (: i'm assuming that's flip flop fantasy? Oh, wow, I just did these too! Love the colours you picked--the pink really gives it a nice, warm kick--and your sponging really looks like far-off, swirling galaxies. Excellent job!